Basket weaving is a method used to create woven baskets by hand from many different natural grasses. Basket weaving has been around for thousands of years, and still continues to be a favorite past time for many people. One of the peoples that were highly associated with weaving baskets was the Native Americans. They chose designs and colors that were vibrant and beautiful, and varied among different tribes. There are many different techniques that are used for weaving baskets that include, but are not limited to twining, weaving, and plaiting. Weaving is known as the technique that is used to create various spokes out of one type of material, and insert different types of strands that are known as weavers one at a time over and under each one of the spokes to form a solid, beautiful woven piece of art. There are many different materials that can be used for basket weaving depending on the type of basket you want to create and the type of method that is being used to create the basket. Basket weaving is one of the biggest and most wide spread crafts through the history of human civilization. There is no real evidence of exactly how old this craft is because the materials used in the craft can decay over time leaving no trace. Without the right type of preservation, a lot of the history of basket weaving has been lost. Some of the oldest baskets that were made have been dated back to 10,000 to 12,000 years ago which is earlier than pottery that has been found. These baskets were found in Upper Egypt. Baskets were also found throughout the Middle East that date to around 7,000 years old. Although a lot of the baskets were not found, imprints of the baskets were left behind on pottery and dishes. Baskets were used throughout factories in the Industrial Revolution for packing and delivering materials. They were also used with balloons to drop off goods to the troops. One of the most popular techniques that is used for basket weaving is using rattan core or reed. This is because the materials are easily and readily available for use. It is a very sturdy material when woven into a basket correctly. Oak, willow, and hickory are also materials that are used in basket weaving, but can be harder to come by. Reed is pliable and easily allows you to turn and twist it into any way you see fit. There is flat reed and oval reed which are used for either square or round baskets. Reed is also able to dye easier than the rest. Reed baskets are often referred to as wicker baskets, although twining is also used to create wicker baskets. Each of the baskets is hand crafted with the type of material that is chosen, using no tools. This allows the crafter to manipulate the materials however they would like to create a unique, one of a kind basket by hand. Sometimes a pattern can be used by the crafter for the specific type of basket they would like to craft. There are three main parts of any basket and they include the base, rim, and side walls of the basket. The basket of choice might also have a handle, lid, or even pretty embellishments around it. 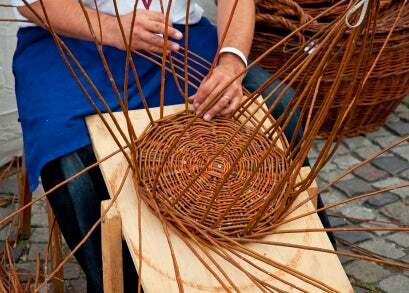 Normally, when a basket is being crafted, the bottom or the base of the basket is the first thing to be crafted. The base can be wooden or woven using reed. The static pieces of the basket are the first to be laid down, and when creating a round basket they are known as spokes, with other shapes they can be referred to as stakes or staves. The weavers of the baskets are then used to fill in and up on the sides of the basket. There are many patterns that you can make while putting together a basket by changing color, size, and the placement of the weaves. The twine can be dyed to create different colors for the basket. Advanced techniques for basket weaving depend on the skill level of the weaver. This is because there are many different styles and techniques of basket weaving out there, and a lot of them can be done simply with a few stitches. The higher quality baskets that are woven are usually done by weavers that have had years of experience. This is because the stitches become more intricate and detailed along the way. Not only does the basket weaver have to know the stitch and the form, but they have to be able to maneuver the material the way they would like. Expert basket weavers also can dye their materials to make colorful intricate patterns while weaving. Underwater basket weaving is also known as an advanced form of basket weaving. Patterns for basket weaving are usually used to create a new type of basket that the crafter is not familiar with. The patterns can range in sizes, shapes, and colors depending on the basket pattern that the crafter chooses to use. The patterns can show the basic beginners of basket weaving how to properly assemble and create their very own basket in simple to follow instructions. Patterns can be found in various places throughout the internet and in craft stores.